It’s that wonderful time of year again! I’m talking about the holidays! Fall and Winter are packed with several holidays right in a row, and I just love it! I especially love all the flavors. 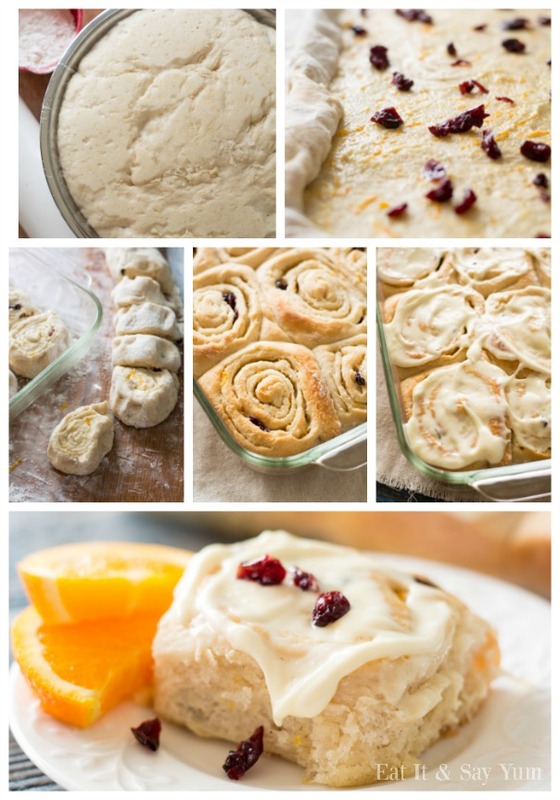 Cinnamon, pumpkin, nutmeg, orange… All so yummy! 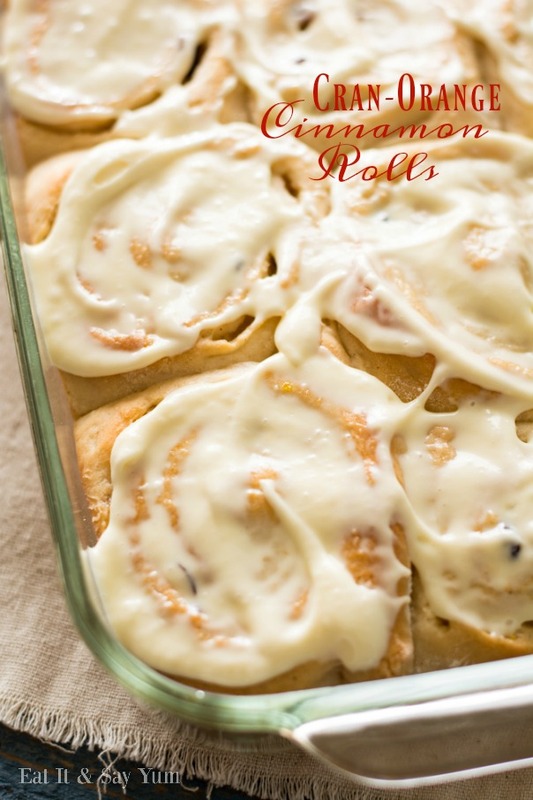 Which makes these delicious Cinnamon Rolls perfect, because they have lots of those favorite flavors. And let me just draw your attention to the Cream Cheese frosting on these bad boys… It has Orange juice in it. And it tastes AMAZING! I was liking the spatula after I was done frosting the rolls. Normally I would give the leftovers to my kids, but instead, I ate it, all by myself. Now, I did make the dough from scratch. That’s just how I roll. 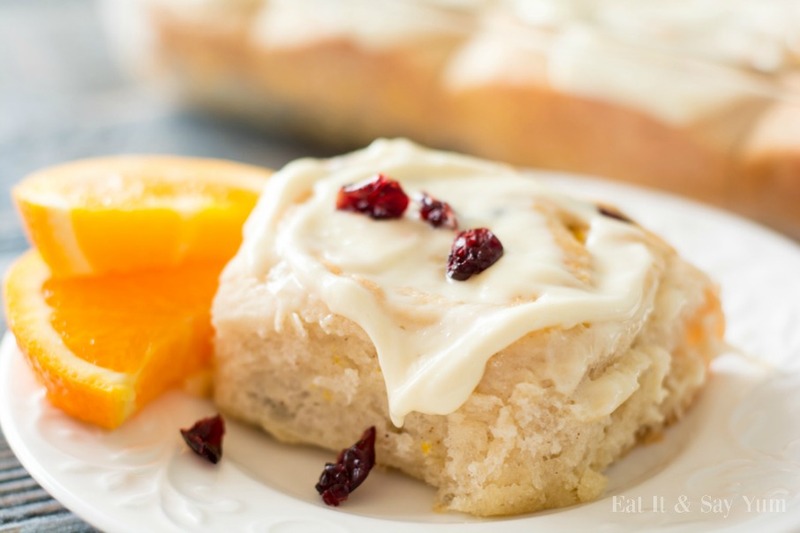 But if you are scared of doing that, just grab some pre made bread dough at the store and then just make the filling and frosting from the recipe below. I don’t promise the rolls will be as tasty as mine, but that is an easy shortcut for any non-dough-makers out there. In a large mixing bowl, combine the water, sugar, yeast, and salt. Give it a quick stir, then let it sit for about 5 minutes to activate (get nice and bubbly). Once bubbly, add the eggs, 1/2 cup butter (nearly melted), and cinnamon- give a quick stir with a fork or wooden spoon. Then start stirring in the flour, 1 cup at a time. Add the last 3/4 cup 1/4 cup at a time- you may need to knead with your hands- just don’t squish the dough between your fingers. The dough will still be slightly sticky, but not wet. Transfer the dough to a large, clean bowl that has been greased. Cover with a tea towel, or greased plastic wrap. Set in a warm place and let the dough rise until it is double in size. I find a warm (about 100 degrees), but turned off oven works well. While the dough is rising, mix all the filling ingredients in a medium bowl- except for the craisins, then set aside. Heavily flour your work surface, where you will roll out your dough. Pour the dough onto the flour, and sprinkle more flour over top. Add more flour as needed to keep the dough from sticking to your counter/ table and your rolling pin. Roll the dough out to a square or rectangle that is at least 24 inches on the short sides. Dough will be pretty thin, be gentle with it. Spread the orange zest filling mixture all over the dough with a rubber spatula- again be gentle. Then sprinkle the craisins all over the dough. Roll the dough into a log, the 24 inch side will be the ends of the log. Cut the log into rolls, just over an inch thick. You should get about 24 rolls. Place the rolls in two greased, 9×13 pans- 12 in each pan. Place the rolls back into a warm oven and let rise again, until they are filling the pan. Remove the rolls from the oven and preheat the oven to 375 degrees, then bake the rolls for 16-20 minutes, or until they are golden brown. While the rolls are cooling, beat the cream cheese until smooth, then add the powdered sugar and beat again. Add the orange juice 1 Tbs at a time and mix, until you reach the desired consistency that you want for frosting. Spread the frosting on the rolls when they are cooled, or just warm. Serve right away, or even freeze for a later day. Tip: Remember you can use store bought dough instead of making your own, if you desire. Also, these rolls are good to be kept on the counter for a few days, otherwise store them in the freezer for longer term. Don’t be scared to try your hand at making these from scratch! It may take some practice to be comfortable with making your own dough, but it’s so worth it!! 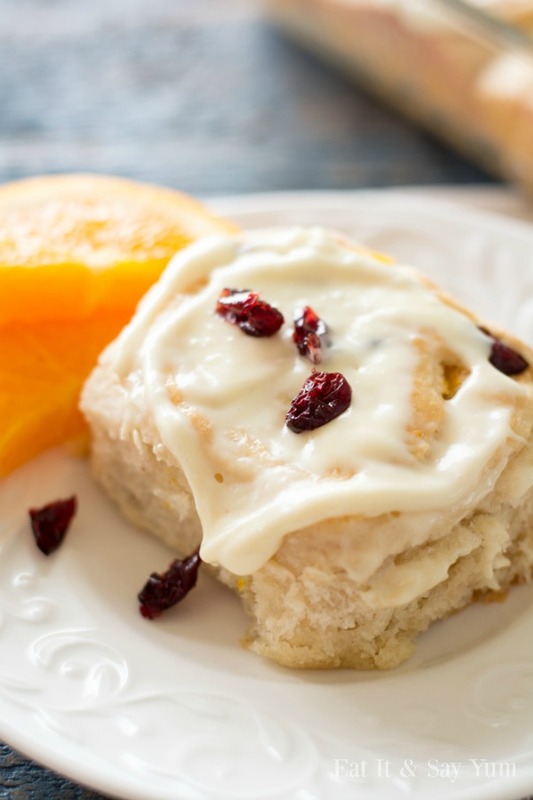 So make your holiday breakfasts even more delicious with these Cran-Orange Cinnamon Rolls! For more delicious recipes visit me at Eat It & Say Yum.